It should be noted that SPA is a general concept and ASP.NET MVC 4 has decided to offer some basic infrastructure to the developers to put this concept into practice. 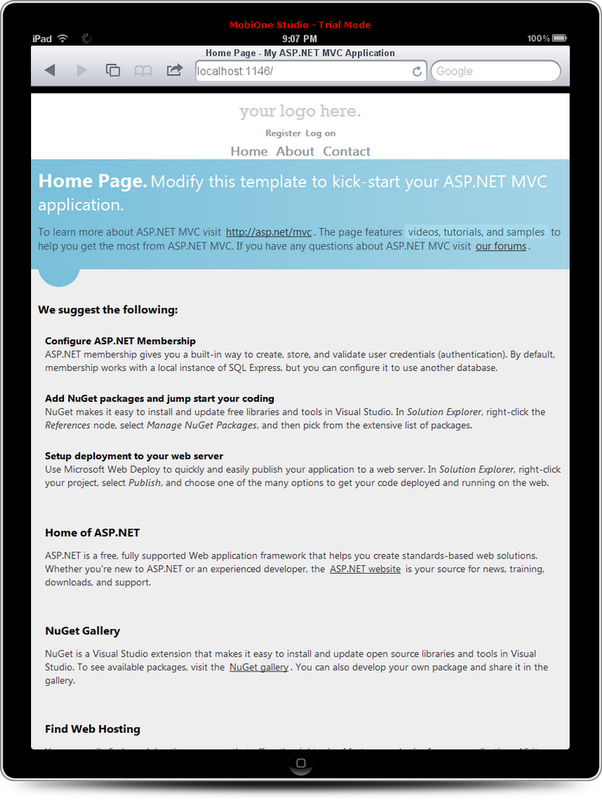 ASP.NET MVC 4 provides a project template that creates a basic yet functional SPA application. You can then customize the application to add more functionality. 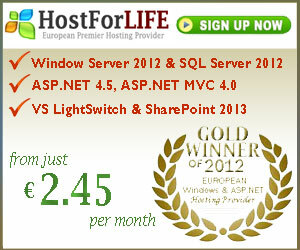 In the discussion that follows you will learn SPA with respect to ASP.NET MVC 4. 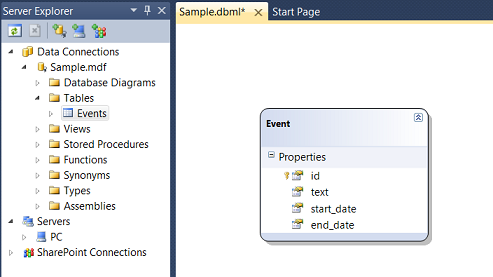 Data Model : This is a server side piece that represents your data (often mapping database tables as .NET objects). Data Service : Data service provides operations for database access (typically CRUD operations). This is also a service side piece and uses Entity Framework Code First approach. ViewModel : View Model refers to your data and UI level operations that you wish to perform on the data. You can think of View Model as a wrapper over your model data that adds UI level operations to it. Database: SPA uses Entity Framework Code First approach for database operations. 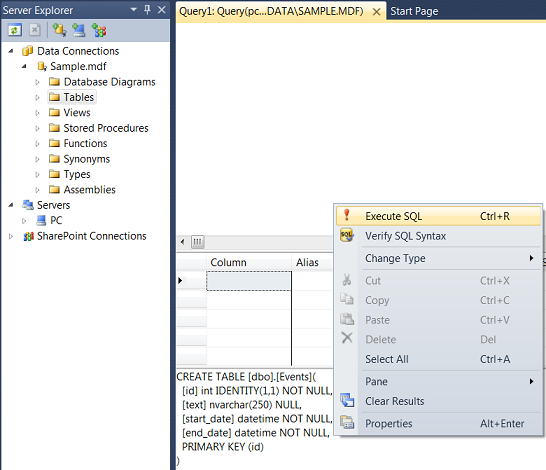 The default project template creates a database in the local installation of SQL Server Express. 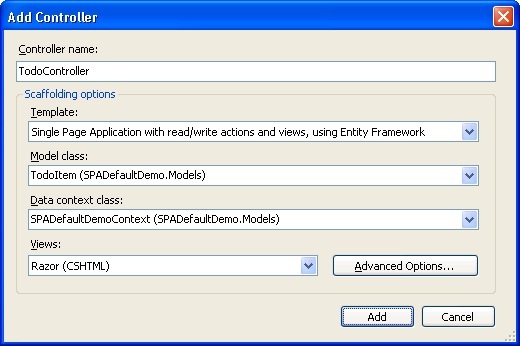 The following sections discuss all these parts from the default SPA project template in detail. 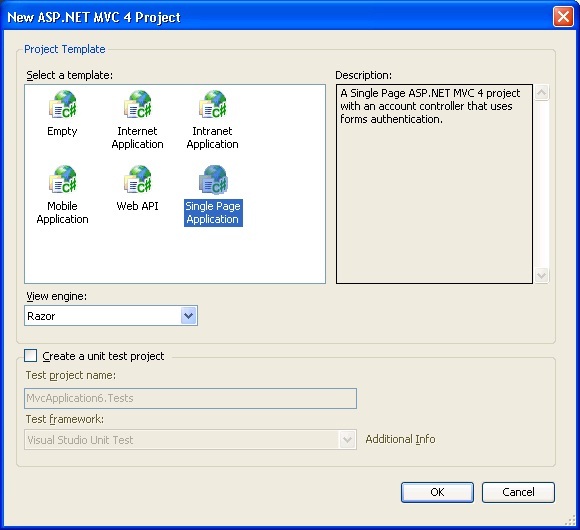 Installing ASP.NET MVC 4 adds a new project template in Visual Studio 2010. 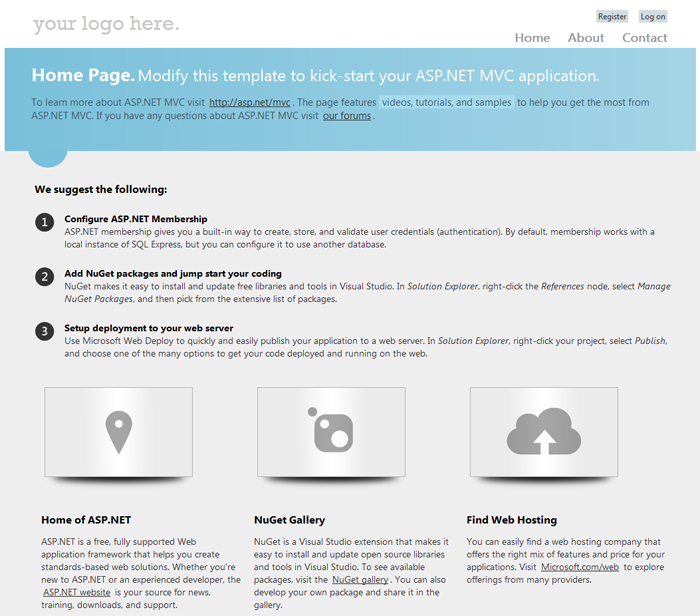 To create a new SPA you should create an ASP.NET MVC4 Web Application project based on this template. As you can see the TodoItem is a simple class with three properties, viz. 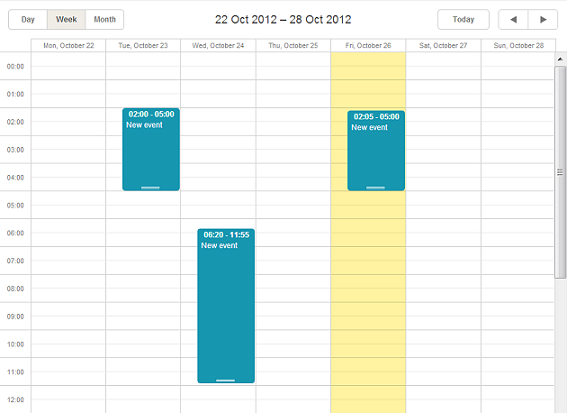 TodoItemId, Title and IsDone. The Title property is a required property as indicated by Data Annotation Attribute [Required]. As you can see the SPADefaultDemoContext class inherits from DbContext base class and contains a DbSet of TodoItem. 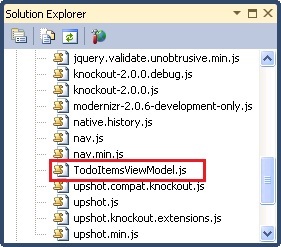 The ViewModel class for the TodoItem data model is created automatically for you and is placed in the Scripts folder. As you can see the TodoItem ViewModel class contains the same properties as the server side data model. These properties are observable properties as indicated by ko.observable() syntax. Knockout synchronizes the data between views and ViewModel. The communication between the ViewModel and the server side data happens through Upshot.js. 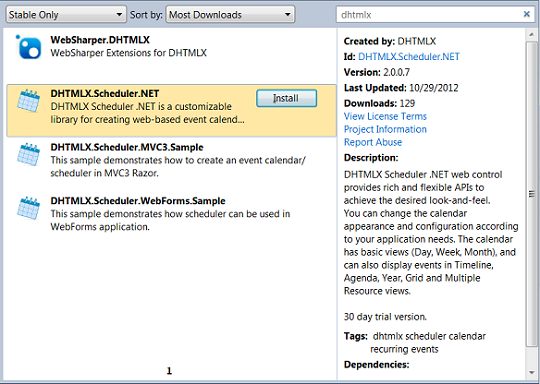 The Index.cshtml file represents the main view of the application. Three partial views are also created viz. _Grid, _Editor and _Paging that provide the user interface for list, insert/update and paging respectively. Depending on the operation selected by the user the appropriate partial view is rendered. The following markup shows a fragment from the Index.cshtml. Notice that data service URL is specified as ~/api/SPADefaultDemo. The Html.Metadata() method provides the metadata of the types to the Upshot. 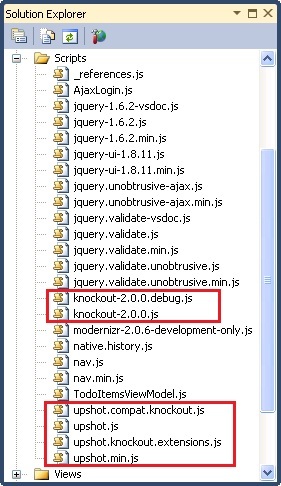 The binding between View and ViewModel is provided by the applyBindings() method of Knockout. If you run the application and navigate to http://localhost:1275/todo (change the port no. as per your setup) you will see something similar to the following figure. You can click on the "Create TodoItem" button to add a few records. You can then modify or delete them. The following figure shows the view in edit mode. At this stage the sample "To do" application is able to store and retrieve the data but you might be wondering where the actual data is. Since SPA uses Code First approach to database operations, the database is automatically created for you when you run the application for the first time. The subsequent runs use the previously created database. Have a look at the following figure that shows a sample database generated under local installation of SQL Express. As you can see, by default the database name is the same as the fully qualified name of the DbContext class. Inside there is a TodoItems table that stores the application data. Note: To see the updates, remember to refresh connection in the Server Explorer. - /Models/CalendarEvent.cs -- a sample model that can be deleted. Sending email is a very common task in any web application for many purposes. In daily development we need to add some mail functionality to our project to send e-mail to the customer or another in our web site. 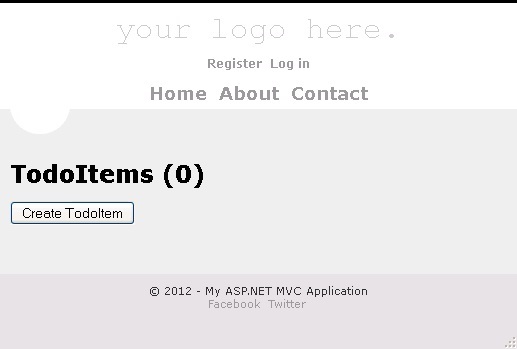 For sending mail from ASP.NET MVC we use the "System.Net.Mail" namespace. Let's see how to do this. "File" -> "New" -> "Project..."
Step 1: Create a new Model Class in the model folder. 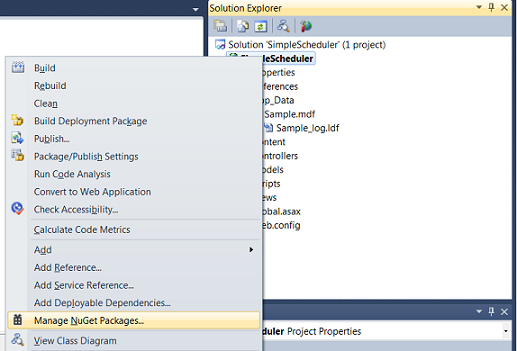 Step 2: Create a New SendMailerController in the Controller folder. The following is the code for the design of the new Controller. When the user clicks the "Send" button, the mail will be sent to the specified mail address that you provide in the To TextBox. So add the following code for the [HttpPost] Method for the send button click. user defined method. In this method, we have a parameter of our MailModel object. Now we create a MailMessage object. MailMessage is the main class for sending mail, it is in the System.Net.Mail namespace. So we add our data into specified properties. For sending mail we need a SMTP Server, so in ASP.Net we have the SmtpClient class, we set the SMTP settings using the properties of that class. That is the SMTP Host address of Gmail, if you want to use any other SMTP host service then please add a different SMTP host protocol, for example for Hotmail it is smtp.live.com. 587 is the port for Gmail, so for any other service port you need to change the port correspondingly. The following is for a secure mail server, so you enable your SSL layer. A website is exposed to various types of attacks and one of the most common types of attack is what is known as Cross Site Scripting (XSS). In a cross site scripting attack, malicious markup and script is entered in the web pages that are viewed by other users. If proper care is not taken to filter this malicious piece of markup, the script gets stored in the system and also rendered on web pages. Depending on the script injected by the hacker it can cause damage ranging from annoying popups to stolen credentials to accessing data stored in cookies. Therefore, it is important for ASP.NET MVC developers to prevent these types of attacks. 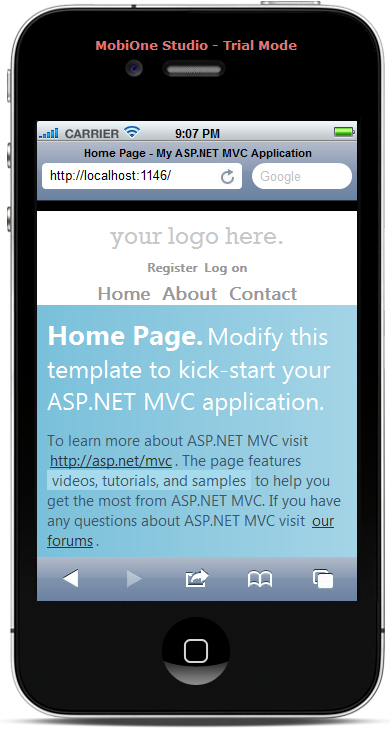 Luckily, ASP.NET MVC offers a helping hand in safeguarding your websites. This article discusses some of the basics involved in the process. What is Cross Site Scripting Attack? When such a user posts the above content it gets saved in the database. Later when this saved content is rendered on a web page it executes the script! What the above example illustrates is a very mild version of a cross site scripting attack. Imagine what would happen if a clever hacker loads a malicious script from some different location and stole end user cookies or loaded undesirable content. That is why it is important for you to prevent cross site scripting attacks. By default ASP.NET 4.5 throws an exception if potentially dangerous content is detected in the request. However, you may need to deviate from this default mechanism in certain cases. In certain legitimate cases it is perfectly acceptable for the user to submit markup. For example, a web page where a blog owner enters the content of a blog post should accept HTML tags. In such cases you can skip the default checking performed by ASP.NET. You can either set requestValidationMode in web.config or use the [ValidateInput] attribute on action methods. As you can see the script is no longer executed even if the comment saved in the database contains the <script> tag. 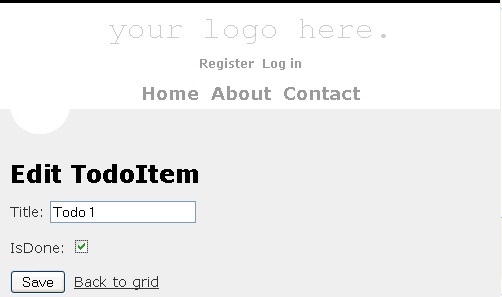 Instead the HTML markup is encoded and then displayed on the page. The <%: and %> block HTML encodes the string and then emits on the page. The above code takes care of displaying content on the page by HTML encoding it. Here the encoding happens at the View level but the database still contains the malicious markup and script. Wouldn't it be nice if you HTML encode the content before saving it into the database? You can do so in your controllers or other classes using the Server.HtmlEncode() method. As you can see the HtmlEncode() method of Server object accepts the raw string and returns an HTML encoded version of the same. The database now stores the HTML encoded version of the comments rather than the raw version. If you need to decode the HTML encoded version back you can use Server.HtmlDecode() method. In addition to the HTML output displayed on a web page, you may also consider encoding attributes and URLs. Encoding attribute values is important if you are dynamically changing them based on user input. For example, you might be accepting a user's website URL and then setting the href attribute of an anchor tag dynamically. In such cases it is better to encode attribute values using the Html.AttributeEncode() method. On the same lines you can encode URL values using the Url.Encode() method. The techniques to prevent cross site scripting attacks that we covered so far are traditional techniques that have roots in the core ASP.NET framework. In some cases where security is extremely important you may want to use an even more secure technique of encoding. Luckily, System.Web.Security.AntiXss namespace provides a class - AntiXssEncoder - that can be used to encode HTML content and attribute values. The major difference between the default encoder used by ASP.NET and the AntiXssEncoder class is that the former uses a blacklist of a set of prohibited characters whereas the later uses a whitelist of a set of allowed characters making it more secure. As you can see, AntiXssEncoder class has static methods such as HtmlEncode() and HtmlAttributeEncode() that can be used to encode form data. As shown above, the encoderType attribute of the <httpRuntime> tag is set to System.Web.Security.AntiXss.AntiXssEncoder so that the default encoder class is now set to AntiXssEncoder. Hello, how do you do? In this article, I will gonna show you how to integrate ASP.NET MVC 4 using Umbraco. Note that Umbraco does not provide a “pure” MVC application as the Umbraco UI comes with a fair amount of webforms baggage. That said, it plays nicely with an MVC 4 project in Visual Studio and provides a flexible view rendering engine that lets you build genuinely testable page templates. Firstly, start an empty MVC 4 project in Visual Studio – make sure it is an empty project as you will not need any of the baggage that comes with other project templates. Add the NuGet Umbraco Cms Core Binaries package which will manage the various dependencies and references that Umbraco 6 requires for you. Copy all the files from the Umbraco installation ZIP archive directly into your project in Visual Studio except the App_Code and Bin folders – you won’t need the binaries as they are managed by NuGet and the App_Code folder is not used in a web application project. Now you’re good to go – run the Umbraco site to set up the database and once the admin console comes up you can create a first view. Note that you may optionally wish to remove the App_Start directory and Global.asax.cs files from your Visual Studio project – they are not used in a default Umbraco application as global.asax inherits directly from the Umbraco.Web.UmbracoApplication class and does not execute this code. If you create and publish a first page based on this content type it will become your site’s home page. This is all you do to start creating pages based on MVC as Umbraco uses a default routing process that delivers the page properties to the view. You can actually build basic content pages without having to worry about the plumbing around controllers and models – this only starts to become important if you want to put more logic in behind the scenes. The default rendering engine for Umbraco routes requests through RenderMvcController with an IPublishedContent object as the model view. This provides a pretty simple means of basic pages rigged up with managed content but you can extend this behavior by creating custom controllers. Umbraco refers to this technique of creating custom controllers as hijacking, though really it is just a matter of creating a controller where MVC would normally look. Creating controllers to handle forms and actions is a little more involved as you have to create what Umbraco calls a surface controller. This is a controller like any other but one that is derived from the Umbraco SurfaceController class. These controllers can be implemented as a normal part of your MVC project (“locally declared” in Umbraco-speak) or implemented as a plug-in for shipping as part of a package. If you want to include your own custom MVC routes then you will have to override the OnApplicationStarted method. This can be done by creating your own custom global.asax file that inherits from Umbraco.Web.UmbracoApplication. Once you have wired up a controller it’s pretty straightforward to create in your own model and pass it into the page. You will need to change the view so that it inherits the generic version of UmbracoViewPage with your custom model specified as the generic parameter. The example below shows the view adjusted for a new model called HomeModel. If you want to take advantage of the Umbraco view helpers then you can extend the RenderModel object by creating a constructor that initialises the base class as shown below. This will ensure that your derived model still exposes the page data and current culture properly. Although it is not a “pure” MVC implementation you can still get Umbraco 6 to sit quite nicely within an MVC 4 web application just so long as you set it up carefully. Beyond the basics of models, views and controllers there is support for features such as partial views and child actions as well as scope for you to use dependency injection and your IoC container of choice. So long as you’re prepared to ignore the messy webforms back-end that lurks in the background Umbraco 6 can really feel like working with an MVC 4 application. MVC 4 introduces many new features. In today post, I will talk about MVC 4 and enhanced default templates. When you create a new project, the default website looks quite different from previous versions. Besides the improved aesthetics, the default website has improved functionality thanks to a technique called adaptive rendering. After you creating a new website, you’ll be able to see the improvements in the default layout. To see the adaptive rendering in action, open the page using a mobile device. Here’s how the page looks on an iPhone. And here’s how the page look on an iPad. The page renders differently depending on the size of the screen. Making the page do that without media queries is tricky. Using media queries makes it simple. Some of you will face this problem when using Bundling and Minification in ASP.NET MVC 4. This post cover about how to fix relative CSS Path in ASP.NET MVC 4. For any images you reference in CSS, move them into a relative folder, such as /images near the CSS. I know, this may be an unacceptable compromise for you. But actually, it makes a lot of sense. The image is probably only used by the CSS so it makes sense to have it nearby, not in some global /images folder. In order to make this work, you need to get your CSS (which you’ve bundled up) into the same place relative to the images you’re reference, or at least, you need to cheat the browser into thinking this happening. Don’t forget that all your “static” content, such as images won’t be affected by Bundling and can be referenced using the folder structure you expect, i.e. the one you’ve set up in Visual Studio. So… when you create the Style Bundle you give it a name which reflects where you have it in your Visual Studio folder structure, then it will pop out the other end in the same place, relatively, to the image files which it’s references! And because the Bundling is happening via ASP.NET, the URL of the CSS file, and wherever it is referenced, works fine in virtual directories!